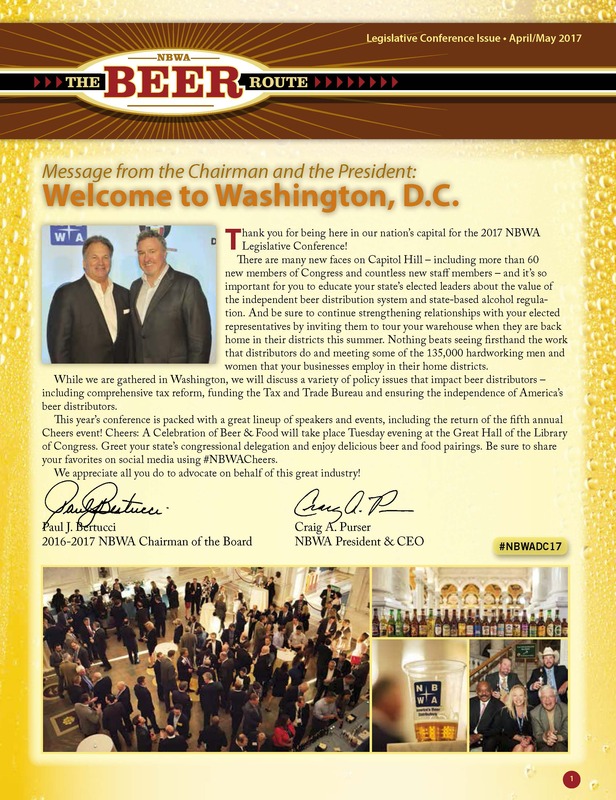 Read the 2017 NBWA Legislative Conference issue, which provides a look at the activities of the National Beer Wholesaler Association and updates from the beer distribution industry. Learn about what's happening in Congress; new NBWA resources to help beer distributors tell their story, the launch of NBWA's @FollowYourBeer Instagram account and the winner of NBWA's Share Your Story contest. Don't miss the latest economic update from NBWA Chief Economist Lester Jones, which looks at how mergers and industry changes are impacting the beer industry, along with a column by NBWA President & CEO Craig Purser looking at how the growth in breweries' direct-to-consumer sales are impacting independent retailers. You also can read about what's on the agenda for NBWA's upcoming Fifth Annual Next Generation Success in Leadership Conference.